Yaws is caused by the T pertenue, which closely resembles the T palladium culturally and morphologically. It measures 20u in length with eight to 12 rigid spirals. The agent occurs in the epidermis of the lesions, lymph glands, spleen and bone marrow. The organism dies rapidly outside the tissues. Man is the only known reservoir of Yaws. He is an infected person. Clinical lesions may relapse two to three times or more during the first five years of infection and serve as a source for new infections. Most latent cases are found in clusters centered around an infectious case. There are frequent relapses in latent cases within the three to five years of infection. The source of infection is usually skin lesions and exudates from early lesions. Variable, and may extend over several years, intermittently, as moist lesions break out. Treponema are usually not found in late lesions. 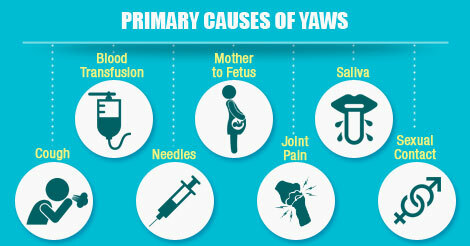 Yaws is primarily a disease of childhood and adolescence. Over 75% of the cases occur before the age of 15. However, the disease could occur at any age. Generally, prevalence among males is greater than among females. Man has no natural immunity. Acquired resistance develops slowly and may take months or even years to develop fully, unless suppressed by treatment. There is considerable experimental and epidemiological evidence that Yaws provides partial immunity to venereal syphilis. The near eradication of Yaws in Haiti has been followed by a high prevalence of venereal syphilis. Yaws is endemic in warm and humid regions. High humidity for at least six months of the year, and an average rainfall of at least 40 inches are considered favorable for the transmission of Yaws. Social factors are even more important than biological factors in the perpetuation of Yaws in the endemic areas. Yaws is mostly endemic among the tribal people in India, whose lifestyle favors its transmission. Scanty clothing, poor personal cleanliness, overcrowding, bad housing, and low standards of living are all important socio–economic factors in the epidemiology of Yaws. It is a crippling disease, lesions on palms and soles may disable a person for long periods and make him/her dependent on others.